Make a Gingerbread House for Advent! This week Franciscan Media is launching “Advent with St. Teresa of Calcutta,” and so I’m reposting one of my favorite Advent traditions here, to give you some extra tips and tricks on how to create your very own Gingerbread House for Advent. This originally appeared on my original blog, “Extraordinary Moms Network.” Enjoy! You can make your own templates to cut out your cookies from poster board or laminated parchment paper. If you’re not architecturally inclined, you can also buy gingerbread house cookie cutters at a craft store or Amazon (I like the Fox Run Gingerbread House Cookie Cutter Set). What do you do with your house once it’s done? That’s really up to you. We like to “smash” our house on New Year’s Eve, and enjoy it with hot chocolate or coffee. Some people like to make two houses, and give one to another family or to a favorite teacher. You can also create a little “village” for your mantelpiece or tabletop. Make this tradition your own — the scent is heavenly, and the fun is contagious. Ready to start baking? Here we go! Remove plastic/waxed paper and place templates on dough, leaving 1/2-inch border around pieces. Use a small, sharp knife to cut around pattern edges. Use fingers or knife to remove scrap dough pieces, leaving house pieces intact on the foil. Cut out doors and windows as desired. Bake at 325 degrees for 10-25 minutes, depending on the size of the pieces. Gingerbread will darken, especially around edges, and feel firm to the touch. While cookies are still warm, put templates back on each piece and trim any extra cookie around the edges (it will expand during the baking process). Cool and peel off foil. Store in a cool, dry place. Pre-baked (trimmed and cooled) gingerbread cookies. (You will need at least six pieces: One base, two pointy front and back pieces, two windowed side pieces, two roof pieces. Royal icing. One batch for each house you are making. When you are not actually using part of the batch, keep the icing covered by a clean, damp paper towel and dishtowel, to keep it from drying out prematurely. You will also need something to “pipe” the frosting (disposable pastry bag or Baggie with the tip clipped off). If you choose to color the icing (I usually don’t), paste gives you bolder colors than liquid food color. Decorations! It’s really up to you what you choose to use. Tinted coconut for grass (or white for snow), frosted sugar cones for trees, Vanilla wafers for roof shingles, wafer cookies for window shutters, front stoop, benches, or door. 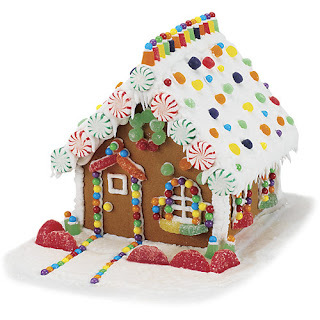 M&Ms or pastel mints for brickwork or around garden beds (I often pipe a “tree” or “lattice” onto the back of my house, and use M&M’s for “flowers.”) Red hots and sprinkles to decorate the tops of roofs and trees. Let your imagination go wild! At the end of November each year (the Friday after Thanksgiving may be a convenient time, since the project can extend an entire weekend), we get started mixing dough, cutting out the templates, and baking each cookie. The next day, we make a batch of royal icing (I cheat and use the powdered kind, but I noticed Danielle Bean (editor of “Faith and Family”) has a good one on her site here). About cutting out the template for each piece of the house: You can make your own out of posterboard or laminated parchment paper. If you’re not architecturally inclined, you can enlarge and trace a simple pattern here. Or, if you’re a little more ambitious, here. Wee Cook Wednesdays: School’s Out … Favorite Kid-Friendly Recipes! I’d like to toss this weeks’ column out to my readers … What is your favorite recipe to make with your kids when you have an afternoon to bake or cook something nice for dinner, and they all want to play “Rachel Ray”? Chris’ favorite is “Bird-in-a-Nest.” Poke a hole in the bread, break an egg into the hole, and grill on both sides. Sarah likes to make “Comfort Cookies.” We made a batch last night (at Sarah’s insistence) to take to a neighbor lady whose dad had passed away. It tickles me pink to see those little empathy buds blossom into full flower! What do you like to make?